'A' class 0-8-0 no. 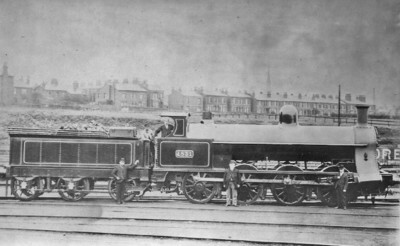 1831 stands with three bowlers and the engine crew posing. The houses behind look as though they could be the key to the location. Does anyone know where this is? I think this is taken on the eastern approach (Crewe line) to Chester General station. The tall chimney visible above the roof tops to the left of the loco's dome is a very distinctive shape, being broad at it's base but having a pronounced taper. This belonged to the pumping station (now demolished) situated on the bank of the River Dee and would be exactly in that position as depicted in the photograph having checked on a street map of the area. The row of houses would be in Hoole Lane (as distinct from Hoole Road which was the bridge over the west end of the station). The other chimney, to the right, I think might belong to the mill which was about a mile downstream but cannot be sure on that point as all prints I have of it show it as being not so tall, but of course it could have been lowered, as many were. My tentative suggestion is Stockport Edgeley. The houses are in Range Road, and the open land has of course been subsequently built on. The lettering on the PO wagon appears to be North.... (Northwich?) but I cannot identify the owner. I certainly do not wish to challenge David Patrick's identification, but if the houses are in Hoole Lane it is hard to reconcile the photo with the track layout at that point, i.e. between Chester No.2 and Chester No.1 cabins. The track layout here consists of six running lines, Up Goods and Down Slow, Up and Down Fast (Warrington) and Up and Down Main (Crewe). I am unable to work out how the engine is standing on points, (all the connections between running lines hereabouts face the other way), and the trackwork looks more like sidings than running lines. Another problem is the coal wagon which surely is not simply standing on a running line. No.1831 was built in July 1898, by which time the rebuilding and enlargement at the east end of Chester station had been completed, i.e. the track layout still in use in BR days had been established. I do not associate 0-8-0 types with Chester. Chester was mainly a passenger shed, and the heavy freight in the area was handled from Mold Junction. I don't think that this is taken at Stockport Edgeley. Looking from the engine shed across the main running lines, the angle of the terraced house if correct, would have to be Kimberley Street with Ladysmith Street behind it. However both of these streets were continuous runs of terraced housing unlike those in the photo which are of stepped construction. In the background is a church steeple, but the only church in the vicinty is in Shaw Heath which according to my 1910 OS map is approximately 0.5 miles away to the left of the engine. There is a somewhat similiar view in Yeadon's Compendium of LNWR Locomotives, Part 1, taken at Stafford. Also the coal wagon could belong to Moreton. Unfortunately I don't have any great knowledge about owners of POWs. Whilst I agree with Philip that there is some doubt as to whether the location is Chester or not, I do not think that that fact depends upon whether 0-8-0s were allocated to Chester or Mold Jn, or whether one was a mainly passenger shed or not. The loco in the print may well have been a Crewe engine on a North Wales freight and is merely picking up or detaching traffic en route. David - that cannot be the case if the location is Hoole Lane between Chester No.1 and No.2 cabins, as there are no sidings there. As I say, the track layout does not fit at all. And why would three railway officers pose themselves proudly before any old passing engine? Surely either the loco is "special" in some way, or the chaps are commemorating some event such as "my 40 years with the LNWR" or whatever. Remember that in those days photography was not casual - the photographer would have had to lug a lot of equipment to the location, and the photo must have been taken "by appointment". My guess is that one would choose to pose before "the pride of the shed" rather than any casually passing engine, the property of some other shed. And if "the pride of the shed" is an 0-8-0 then I guess that the steam shed was mainly a freight depot - if one had "namers" would not one of those be chosen? I would conjecture that the chaps are the (plump!) shed foreman (centre), the chief clerk (right) and the timekeeper (left). The spire in the background comes to a point, so I think must be a church, not a chimney. I agree - not Stockport, but I am sure not Chester either. Could it possibly be Crewe South (opened 1897) with a brand new engine built in July 1898? Another conjectural idea is Warrington (Dallam) in which case the road would be Lifford Street. This whole area has been totally redeveloped in recent years. I have searched for a PO wagon owner "Moreton", but without result. But the legend "North...." (surely Northwich?) indicates somewhere not far from there. I do not know where this photograph was taken but have two comments. Firstly, I have been through Yeadon Part One and cannot find a photograph showing similar houses at Stafford. In any case, most of the houses near the railway at Stafford are still there, and none of them, so far as I can see, bear any resemblance to those in the photograph. Secondly, coal trains regularly operated between South Wales and Birkenhead (bunkering coal for ships) and between South Wales and Holyhead (coal for LNWR steamers - see recent article by Peter Ellis in the Journal), so these workings could easily have brought an 0-8-0 on to Chester shed. As I say, Chester (6A in LMS/BR code) was exclusively a passenger shed, and in the 1950s had no freight locos of any kind assigned, except for some 3F 0-6-0T shunters which were doubtless station pilots. But Birkenhead is another possibility to be considered, although I can find nothing to support this. The houses in the background do not match the ones on Hoole Lane; they are too far away, grouped differently to the ones in existence, and the style is different. The fall of the land is wrong. There is a church on the alignment of the one with a spire in the background, but the one in Chester (in Boughton) only has a small pseudo spire on the roof. This is not Crewe South (there are no houses there and never have been). It is not Stafford (the houses do not fit). Nor is it Chester or Warrington. In fact, the engine is standing in Edgeley Sidings, which were in the V formed by the Stockport � Crewe main line (behind the camera) and the Stockport - Cheadle line, curving away behind the engine; it is facing towards Edgeley shed and Stockport. The houses are still there, though perhaps partially hidden by more recent construction, and the chimney (not a church spire) belonged to the factory of Sykes Ltd. There is another photograph of an 'A' Class 0-8-0, no. 2545, at the same place. Edgeley Sidings were in effect Stockport Down Yard, though not known as such, while the up sidings alongside Stockport station were in effect the Up Yard. After the construction of the much more extensive Adswood Sidings, Edgeley Sidings lost their main role but continued in use for storing wagons and so forth. This information came from Mike Bentley of Buxton, who went on to say: "Many if not all of the photographs in the collection of S.S. Scott were inherited by Dudley Whitworth, and when Dudley died, his photographic collection passed to the LNWR Society. I was asked to copy a large number of them, one of which was an original print of this picture. On the back of the print was written 'S.S. Scott. Edgeley'. Scott liked engine photographs to include railway staff, drivers, firemen and so forth, as in this picture; the photograph was probably not taken by him but by a local photographer called Lang, who lived in Disley. So presumably this photograph is in the LNWRS collection ... "
I lived in the Edgeley district for the first 23 years of my life and know the area well. This picture could in fact be at Edgeley sidings but not as Ted has described. The loco faces towards Adswood not Stockport. I think it stands on tracks in the shed yard from where the photograph was taken. The houses in the background are the Victorian types which overlooked the bowling greens and so on of Range Rd park. These were hidden later by a row of more modern semi-detatched houses which appear on many photographs of Edgeley sidings and shed, behind a close board fence and were in fact on Range Rd. If that is a church steeple in the background it could only be St. Georges on Wellington Rd. There was a chimney on the old Co-op dairy further to the right. Could that be it ahead of the loco buffer plank? Oh dear Ted, Sykes bleachworks chimney, the tallest in the district at 303ft would be somewhere in the direction of the photographer's right shoulder about � mile away and the house I lived in was in between in Petersburgh Rd. Had the photographer panned a little more to the right the works of Mc Clure and Whitfield Dynamos would have given positive evidence. I do believe that the tracks in the background were widened to accommodate a slow line running south towards Adswood and the south around the time the newer houses were built in Range Rd. The loco. could be standing on the coaling stage track. Geoffrey Holt is spot on with his descriptions of Stockport Edgeley. The only additional information is that the row of houses in the photograph are in Florist Street, Shaw Heath. They are still standing. Adding to the comments of Geoffrey Holt, if the locomotive is indeed in Edgeley Junction Sidings, sometimes known as Adswood Siding, the church spire would indeed be St. Georges on Wellington Road, and the chimney on the right hand side would belong to the Heaviley Mill, a confectionery company. For all this to be correct would mean that unfortunately Alan Budge is mistaken in saying that the houses are in Florist Street. The houses would have to be at the junction of Adswood Old Road, Range Road which is in Cale Green. For Florist Road to appear the photo would have to be taken prior to 1910, and the engine would have to be between the tunnels at Booth Street and the entrance to the shed yard, otherwise they would be blocked out of view by Ladysmith and Kimberley Streets. As Geoffrey says, confirmation would be the rather prominent hat and engineering works which were backed right up to the main running lines just to the left of where the locomotive is standing. Geoffrey Holt says "the loco could be stood on the coaling stage track". This means on the loco shed near the entrance to the tunnels and the coaling stage/ash pit/water tower. By going to multimap and typing in "florist street" then zooming in and turning the map to the left then going to birds eye view it can be seen that "florist street" is still there, almost exactly as in the photograph. The railway personnel standing by the locomotive could be shed staff such as foreman, shed master or telegraph boy. As Alan Budge says, the houses in the background are in Florist Street, Shaw Heath, Stockport. The Ordnance Survey 1:2500 plan shows blocks of exactly this configuration, except that one house (in the photograph, just above the front of no. 1831's cab) has been built since the date of the survey, 1892/3. Between the railway and Florist Street, two streets were built later and were in existence by the date of the next OS plan, 1907. That these streets were named Kimberley and Ladysmith suggests the likely date of their construction: the towns with these names were besieged by the Boers and relieved - with much public rejoicing - in February 1900. So the date of the photograph is between 1898 and 1907 at the latest, and more likely 1898 to 1901/2. It may well have been taken in 1898 when the engine was brand-new. The photograph was taken from practically the same position as Mystery Photo no. 88, but maybe 30 years earlier, and looking east rather than north-east. The water tank/coaling stage was just off to the left, and the front of the engine shed was about 140 feet away to the right. The church spire belongs, as Geoffrey Holt says, to St George's, while the factory chimney at the right was at the Heaviley Mill between Bramhall Lane and Buxton Road. It was a cotton mill in 1892, but was a confectionery works by 1907. As so often, contemporary large-scale plans and a straightedge can reveal a lot. Well, I was almost right, but indeed I ought to have realised that Kimberley and Ladysmith Streets post-dated the picture.